Numerous organizations and institutions have traditionally represented, advocated for, or served those U.S. populations that are identified as vulnerable to environmental hazards and emergencies. However, we know little about how these organizations currently perceive or are acting on these threats to their constituent communities—in particular, the threats from hazards associated with climate change’s effects. 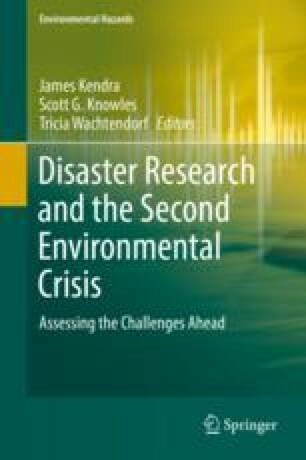 This chapter documents the organizations’ current climate adaptation strategies and activities on behalf of these populations if any, and describes key themes regarding the contexts and challenges, surrounding the current state as well as the opportunities for possible future action. Structured interviews were held with representatives from a wide pool of organizational types, from local environmental justice groups to national civil rights and environmental advocacy institutions. Responses corroborated the study’s primary finding from policy and document reviews: the groups’ current advocacy or programming related to climate change is generally nascent and, on the whole, does not extend beyond the identification of general vulnerabilities. The silence, however, is not intentional. External and contextual barriers continue to hinder many organizations: the current national policy direction is focused almost exclusively on climate mitigation strategies over adaptation planning and action, and on equity in disaster recovery rather than in disaster mitigation and preparedness. Internal institutional barriers persist as well, such as resource constraints, gaps in technical capacity, and the lack of a demographically diverse staff that is attuned to the concerns within the vulnerable communities in question. Local groups also struggle with the task of messaging climate change in communities that face a broad array of intersecting social, economic, and environmental challenges. To overcome these barriers, the author suggests policy and funding instruments that expand the technical and resource capacity of local organizations like environmental justice groups to better serve their vulnerable constituents’ adaptation needs. However, the investment must produce actionable programming tied to the goals of current environmental and emergency management policy and to achievable community outcomes beyond solely identifying vulnerabilities.